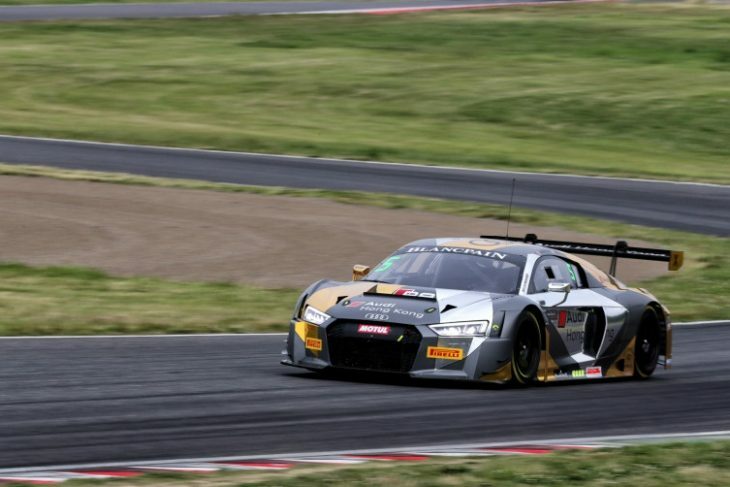 Marchy Lee and Shaun Thong claimed the Blancpain GT Series Asia championship lead with a convincing victory in the first of this weekend’s two races at Suzuka earlier today. The Audi Hong Kong pairing overcame a pitstop success penalty to beat Nick Foster and Devon Modell’s Craft-Bamboo Racing Porsche by 16.5s, while OD Racing’s Mitch Gilbert and Aditya Patel completed the overall podium. 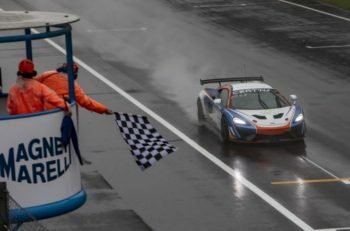 Meanwhile, Frank Yu’s storming second stint helped he and Craft-Bamboo Racing co-driver Jean-Marc Merlin claim their third GT4 class victory of the season. Their combined efforts were enough to beat Taiwan Top Speed Racing’s George Chou and Keo Chang by one second. The #5 Audi R8 LMS GT3 started third but was well worth its victory following a fault-free performance from this year’s leading Silver Cup crew in the weekend’s opening 60-minute race. Lee was already up to second as the field plunged into Turn 1 after passing Patel, and then pounced on a mistake from Craft-Bamboo Racing’s pole-sitter Darryl O’Young at the final chicane to lead by the end of lap one. The gap between them fluctuated for much of the opening stint before Lee finally began to edge clear en route to a 3.5s lead before the pit window opened after 25 minutes. The top-two were both forced to complete another lap while behind Patel led the ARN Racing Ferrari of Hiroaki Nagai, Hunter Abbott’s GruppeM Racing Mercedes-AMG, Modell’s Porsche and Sandy Stuvik’s VSR Lamborghini into the pits. Lee pitted next time around but retained a net second place despite having to serve a seven-second success penalty for finishing as runner-up at Buriram. Similar handicaps for the chasing OD Racing Audi, ARN Racing Ferrari and GruppeM Mercedes-AMG undoubtedly helped, but it was no surprise to see O’Young’s penalty-free co-driver Peter Li emerge from the pits ahead. The Craft-Bamboo Racing Porsche’s lead lasted a matter of corners, though, when a big moment for Li handed Thong a winning position he never looked like losing. While the battle raged behind, the Hong Kong driver duly romped clear to claim his, Lee’s and Phoenix Racing Asia/Audi Hong Kong’s maiden Blancpain GT Series Asia victory. Further back Li was soon under pressure from team-mate Foster whose success penalty-free stop helped the Australian initially pick up two places from where Modell had pitted, before also passing Gilbert on track. The two Craft-Bamboo Porsches then circulated together before #88 made its move and pulled clear. Gilbert was also soon in on the act, the Malaysian executing a particularly opportunistic pass in traffic to ultimately claim the final place on the podium. Li, meanwhile, regrouped to finish fourth following an incredible final lap that ended with six cars covered by just three seconds. It began with Maxi Goetz – who’d taken over from Abbott – nudging the back of Li’s Porsche into Spoon, which cost both drivers momentum. Li just held on, but Spirit of Race’s Rui Aguas and ARN Racing’s Kota Sasaki both pounced on the damaged Mercedes-AMG to claim fifth and sixth places, while Nicolas Costa came within 0.061s of stealing seventh for himself and Stuvik. Massimiliano Wiser set fastest lap in pursuit of the points and duly finished a tenth behind the VSR Lamborghini, while Alex Yoong’s Audi R8 LMS Cup entry completed the points-paying positions. Andrew Haryanto and Samson Chan converted X-One Motorsports’ Am Cup pole into a 16s class victory over T2 Motorsports’ Gregory Teo Bee Tat and David Tjiptobiantoro, while KCMG’s Naoto Takeda and Takuya Shirasaka completed the podium. All of that provisionally leaves Lee and Thong top of the GT3 standings by 13 points from Patel and Mitchell, while Abbott’s seventh place has dropped him from first to third. GT4 went down to the wire after diverging strategies brought the top-two together on the penultimate lap. George Chou led away from pole but couldn’t shake off Jean-Marc Merlin, who was soon running second after starting fourth. The gap fluctuated between the pair but was less than two seconds when Craft-Bamboo’s Porsche pitted at the first opportunity. Taiwan Top Speed instead opted to keep Chou aboard for as long as possible, which – when added to Craft-Bamboo’s five-second longer pitstop success penalty – resulted in Keo Chang emerging with an 11s lead. Yu wasn’t giving up, though, and duly reeled in his class rival over the remainder of the race. 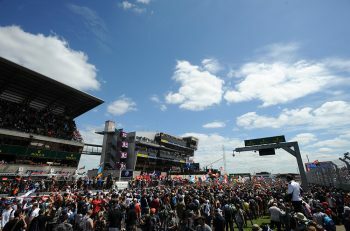 Suzuka’s tight confines made gauging the GT3 traffic difficult, but by the penultimate lap Yu was sufficiently close to pressure Chang into a mistake at Degner 2, allowing him to dive inside at the next hairpin before taking the chequered flag one second clear. HubAuto Racing’s Masahiko Ida and Ringo Chong claimed the final podium place. Tomorrow’s second Blancpain GT Series Asia race begins at 11:30 local time.